Did you know that caladiums initially grew only in the Amazon basin in Brazil? Now they are widely grown all over the world, and people love them for their bright colors. There are plenty of varieties to choose from if you’re considering landscaping with caladiums. For this reason, today we are going to make a brief presentation of these great plants, show you why you should choose them for your garden, and give some suggestions about the landscaping. As we mentioned, they are a species with tropical foliage. They have leaves shaped like a heart or a triangle, with very bright colors. Caladiums can reach a height of 12 – 30 inches, depending on what variety you choose and how you take care of it. They have colors varying from pink to red or white. Usually, they grow best in a warm and moist soil. This type of plant doesn’t love cold at all, which means that you must protect it during winter if you want to plant again next year. People choose to plant them in their backyard because they offer plenty of colors even in the shade, where most flowers don’t grow. However, their most convincing advantage is that they require little maintenance whatsoever. 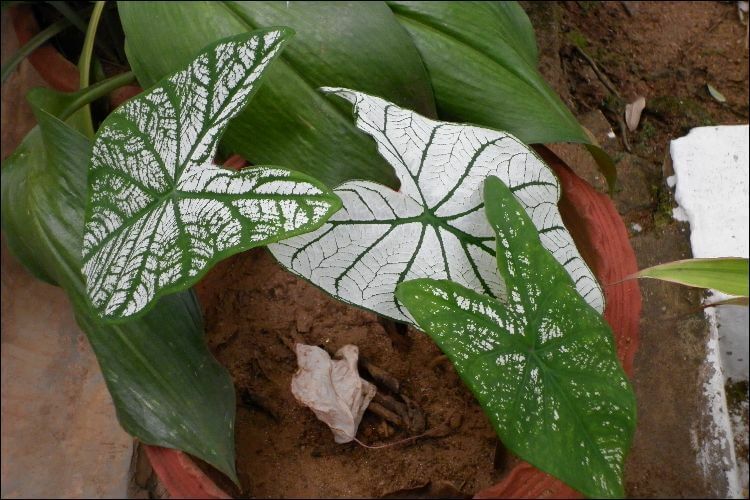 For more reasons why you should be landscaping with caladiums, see below. 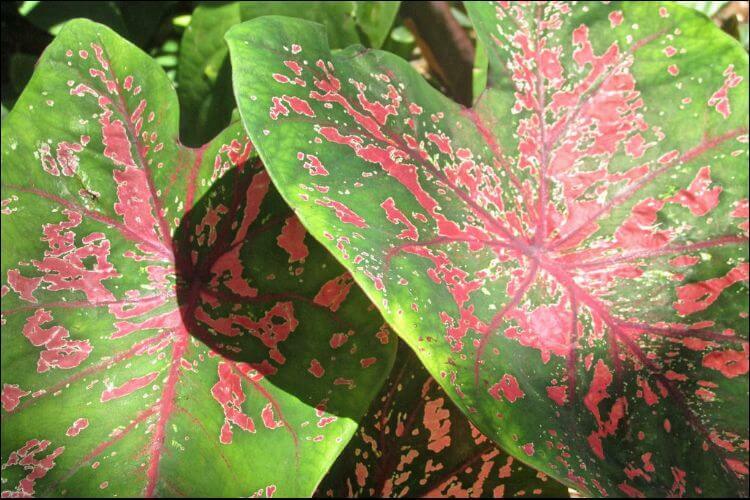 So, one of the reasons you should be going for a caladium garden is that they need little maintenance. However, there are other reasons as well. It’s very easy to find colorful plants or flowers for the sunny areas in your garden, but what about the shade ones? 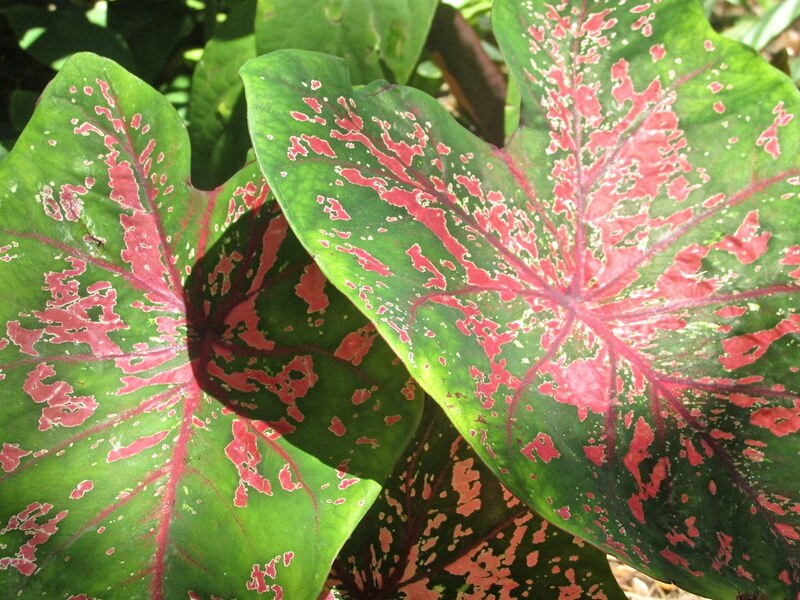 Caladiums are perfect if you want to take advantage of their bright colors and liven up your landscape. 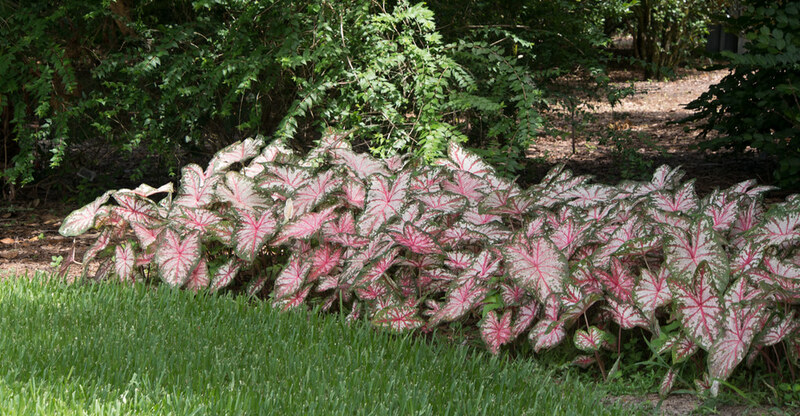 Just like other bulbs that bloom in summer, caladiums know how to manage on their own. You just need to offer them some care in the beginning with planting. Then, they need no other care to rise and start growing. Being native from the Amazon, caladiums grow even faster when the weather is hot and humid. On the contrary, other plants start growing at a slower pace when this happens, with the purpose of conserving energy. However, they can grow equally well both in sun and shade. For example, if you have a yard with big trees and the sun and shade vary, landscaping with caladiums is a perfect choice. You can also grow them in containers if you want since they can thrive there as well. Now that you are more familiar with these plants and why are they a great choice for your landscape, let’s see a couple of suggestions. Naturally, you can combine various ideas presented below or choose just one, depending on your personal preferences. Thanks to their bright colors, caladiums can be an excellent option for focal points. You can create these in patios, entryways or around a pool. 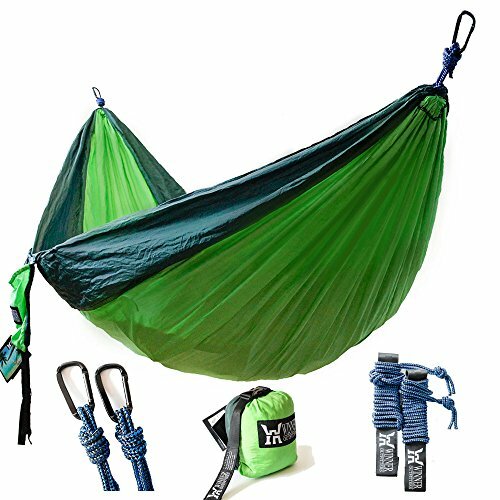 Whether you choose the Fancy Leaf or Strap Leaf varieties, they are great for a lush, colorful aspect. Miss Muffet variety & Ipomoea Blackie (sweet potato vine). As we mentioned earlier, you can grow caladiums in pots and containers as well. 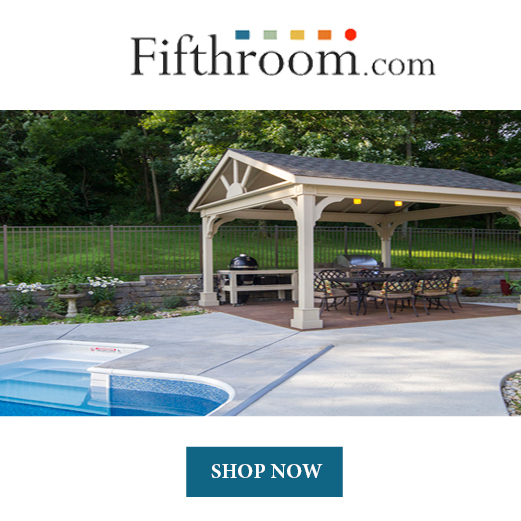 This is great for a patio if you want to move them around or plan on making changes in your design soon enough. Moreover, this option lets you play around with textures and colors. 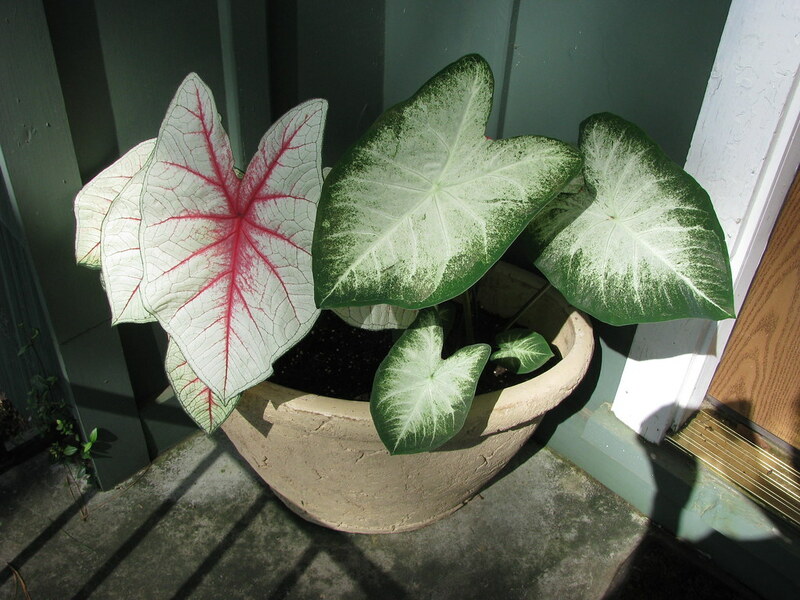 Ideally, if you plant a caladium in a pot, you can finish up the look with some ornamental grass. White Christmas – it shows bright white leaves with dark green veins and it can also resist in plenty of sunlight. Gingerland and Miss Muffet – dwarf varieties that are great for hanging baskets. Another valuable suggestion when using caladiums for your own garden is to plant them in a shady area and combine them with some perennials. We mentioned earlier hostas, which are perfect companions. Other options are daffodils and forget-me-nots. You can also go for low-lying flowers as well, such as lamium or lily-of-the-valley. 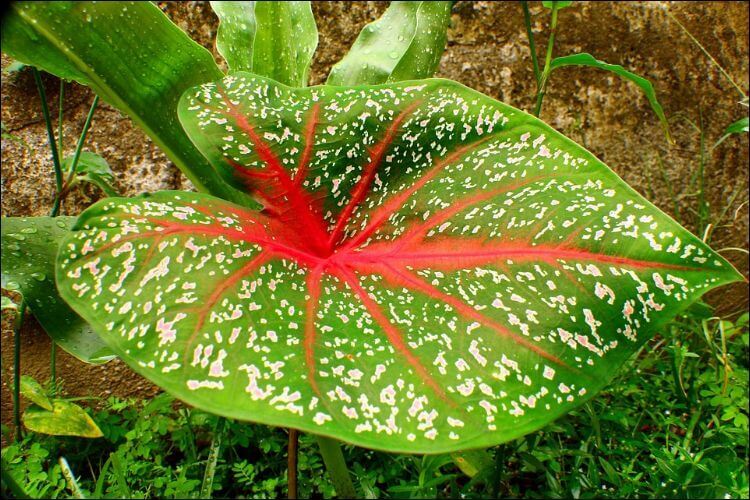 Basically, any shady and leafy green plants will provide a nice background for colorful caladiums. Caladiums can be the perfect choice if you want to highlight some borders in your garden. If you have a green lawn, you can edge the driveway with brightly pink or red leaves. Once again, it will create a nice contrast and you will get the most of your landscape. Another great option if you want to use caladiums in your garden is to plant them in big swathes. In this case, you would need to separate the varieties. This is a good idea if you want to obtain a more geometric aspect of the backyard. The result will be an array of blocks of color placed on a lawn. If you’re not too familiar with caladiums, it might be better to start with this design, since it’s easier to do. 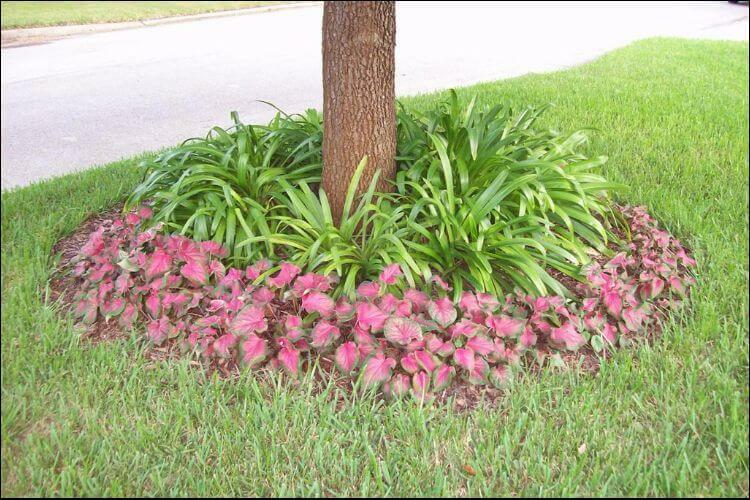 Moreover, you can learn how to grow Bermuda grass and create a nice background for the caladium swathes. Depending on the varieties you choose to plant outdoors, you can use the same plants indoors as well. Besides a traditional arrangement, you can cut caladium leaves and make a floral arrangement out of them. If you keep them in a vase with water, they can last for more than two weeks. If you want to take it even further, you can reuse some old vases and place them in your garden for an extra effect. If you happen to have a pool or a pond in your backyard, it’s great to use caladiums to line them up. You can choose to plant taller varieties and obtain a privacy wall a couple of meters around your pool, for example. If you choose just one variety, you will have a wall in the same color all over the place. If not, you can alternate the shades and types of leaves for a more interesting result with poolscaping. Choose different types of planters and fill them up with soil. Next, plant the caladiums or transplant them from where you kept them. Here, you can choose whether to grow the same variety in all the pots or different ones. Different varieties will ensure a more complex design. Finally, use some wooden shelves and place the pots on them. The more diverse they are, the better. If you want to mask a fence in your garden, it’s a great idea to plant caladiums next to it. Taller varieties are recommended since they can cover up the fence entirely. Moreover, the fence can be a great support for it. You can also combine it with other types of ivy, for instance, to offer a great green background. 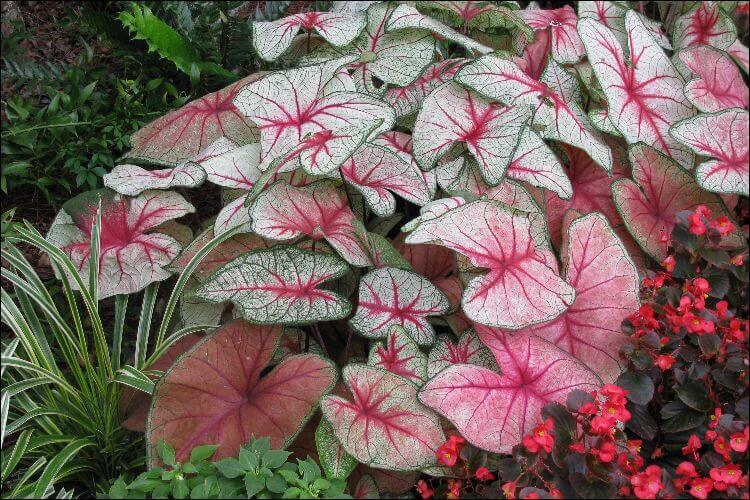 So, caladiums are beautiful tropical plants that lend an exquisite effect to your garden. 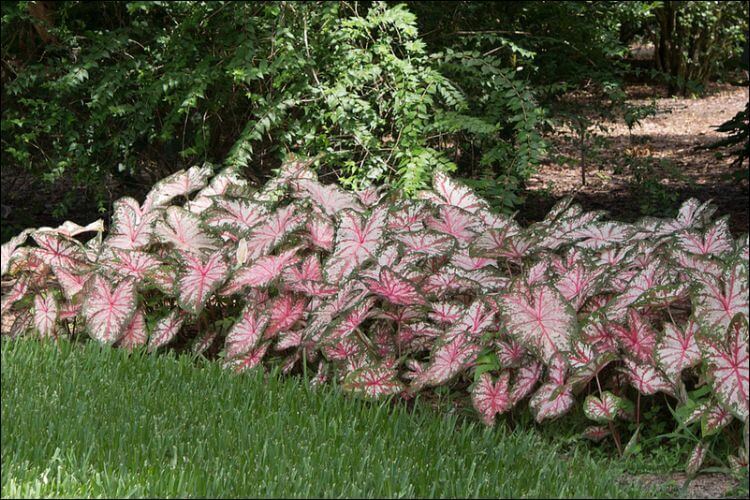 It’s a great idea to go for landscaping with caladiums if you want to bring as much color as possible in your yard. The most common theme when creating the design is to make a contrast with the brightly colored leaves of the caladiums and a green, leafy background. Many gardeners love this duality. 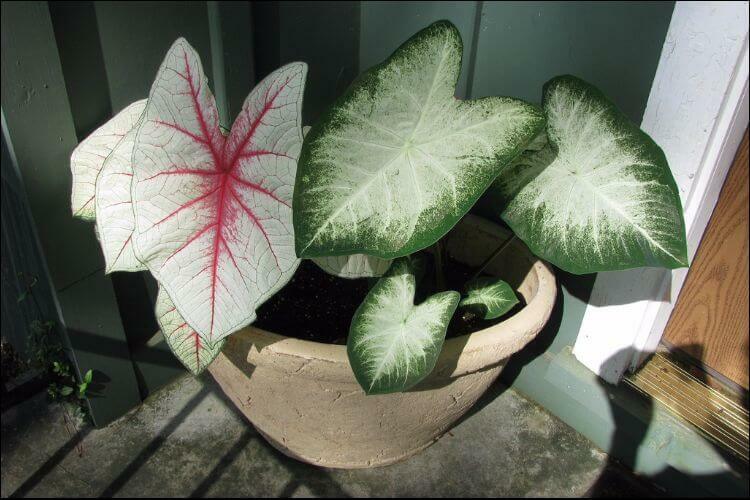 What’s more, caladiums are so popular because they require very little maintenance. 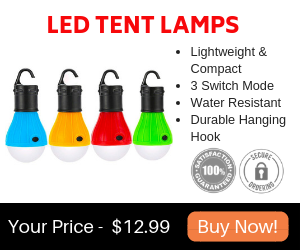 They can develop excellently both in the sun and shade, so you don’t have to worry about special requirements anymore. All in all, there are plenty of ways in which you can integrate caladiums into your own design, so don’t be afraid to experiment!